Get started with the digital hub for teaching and learning in Office 365 Education. Support rich collaboration and seamless experiences with integrated apps from Office 365 like Word, Excel, PowerPoint, and OneNote Class Notebook, and education partners like busuu, Canvas, Flipgrid, and Kahoot! 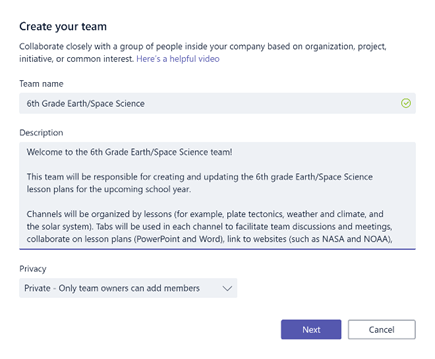 Note: Office 365 Education now includes Teams. This means that Teams is free for all faculty, staff, and students through Office 365 Education! The table below describes a few examples of ways teachers can work together in Teams, to help support innovative teaching methods and best practices in collaborative classrooms and schools. Learn more about the new experiences in Teams designed for teachers, students, and staff! Save time and easily organize classroom discussions, manage assignments, and collaborate with students to create personalized learning environments and address your students’ unique learning and development needs. Developing lesson plans for different subjects and grade levels requires effective communication and collaboration among teachers across the school or district. Collaborate in professional learning communities (PLCs) and share best practices to help shape professional development opportunities and support to your peers. A recent study found that after-school programs overwhelmingly improve students’ STEM career knowledge (80%), promote a more positive attitude about STEM (78%), and increase perseverance and critical thinking skills (72%)1. Teachers can work together to constantly create exciting and stimulating activities to encourage students to participate in these important, voluntary programs. You can create teams for different class periods, projects, activities (as needed), and invite others in the school or district to join as team members. 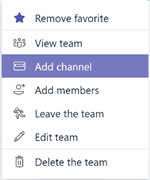 Teams can also be created based on existing Office 365 Groups, and any changes made to the Office 365 Groups will automatically be synced in Teams. This simplifies the process of inviting and managing team members, and saves group files in Teams. For example, individual classes can be further organized into channels that contain tabs for conversations, files, notes, and more. 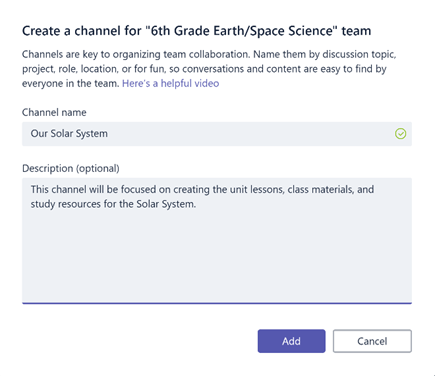 Channels can be created based on the class’s different needs, for example, by unit, subject, or by project-based group. Tabs enable the class to upload, review, edit files, notes, and customized content (such as documents, spreadsheets, presentations, videos, external links, other applications, and more). This content is then easily accessible to everyone in the class. Tip: Setting up Teams on your mobile device is easy and will ensure you can conveniently stay connected with your class from anywhere, at any time, and on any device. You can download Teams from the Windows Store (Windows Phone), App Store (Apple iOS) or Google Play (Android). Begin with a kickoff meeting to set expectations, provide guidance, and demonstrate the basics of Teams. Ask your class to use Teams as their primary communication and collaboration tool for your team-based activities. Successful teams need simple and intuitive tools to enable fast and effective communication as well as collaboration. Whether you’re preparing lesson plans, creating a personalized learning environment, developing an after-school program, managing any other team-based activity or project, Teams can help you get organized for success. In the following steps, we’ll show you how to get started and customize Teams for your class scenario. To launch Teams, go to the app launcher – the “waffle” – in the upper left corner of Office 365 Education and click Teams to open the online app (or download it to your desktop). Note: If you’re having trouble accessing Teams, contact your IT Admin to make sure you have the right license. Click the Create team button then select Classes. Note: If your school uses School Data Sync, your classes will automatically be created for your with student rosters connected to your school’s information system, so you don’t have to worry about this step. In the Create your team window, name your class and write a brief description that explains the purpose of the class, then click the Next button. Note: Leave the Privacy option set to Private—Only team owners can add members (you can change this setting later if needed). Tip: Before you train your class, go ahead and customize the setup of Teams. Begin by creating your class, setting up a few channels, and adding a few tabs. Then seed a few tabs with some relevant, engaging, and helpful content. 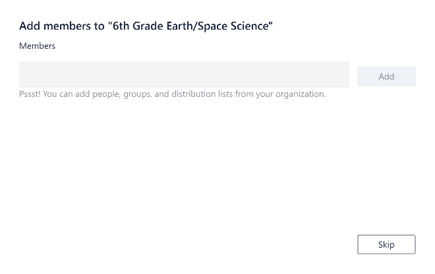 You can easily add people, groups, and distribution lists from your school or district. As you begin typing names, a dropdown list of people in your email directory matching your spelling will appear. Click the Add button to add team members, or click the Skip button to add team members later if you want to set up your content first (recommended). 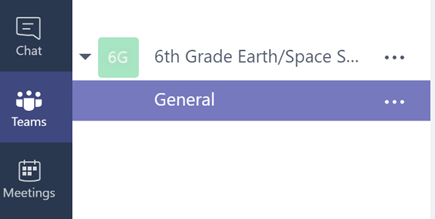 When you create a new class, a "General" channel is automatically added to the class. You can create additional channels to keep your class organized. By default, anyone on the team can access these channels. Tip: Post Teams training tips and announcements to the General channel for easy reference. This will be a convenient place for the entire class to get help and guidance, but especially useful for new members joining Teams. To create additional channels, select the ellipses (...) next to your team name in the channel list. Select Add channel from the dropdown menu. In the dialog box, name your channel and write a brief description that explains the purpose of the channel, then select the Add button. Tip: Once you’ve created a few channels, you can seed them with some actual content so that your class doesn’t see a blank page the first time they log in. For example, you might start a new conversation by posting a few questions in each channel to get a few discussions started and @mention specific class members to pull them into the conversation. Within individual channels, you can create tabs for different content and applications. Several default tabs are created within each channel, including Conversations, Files, Class Notebooks, and Assignments. To create a new tab, select the + to the right of the default tabs, then select an app or file for the tab (such as Word or Planner), name it, and select the Save button. Note: The setup steps for some applications and services may differ slightly from the instructions provided here. To create a new tab that links directly to a specific file (such as a lesson plan or outline or an interactive class presentation), click the + to the right of the default tabs, then select the app for the file type (such as a Word document, Excel spreadsheet, or PowerPoint presentation), browse to the file name under "Files," name the tab, and select the Save button. 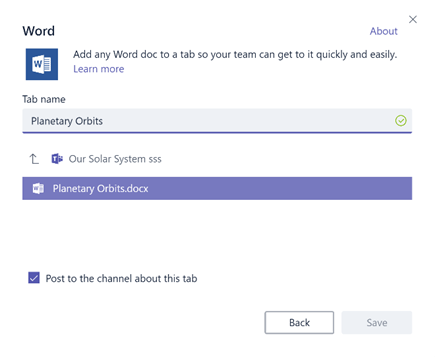 Tip: You can pin an existing OneNote Class Notebook from a SharePoint site or other website (globe icon) directly to your channel as a tab for easy team access. 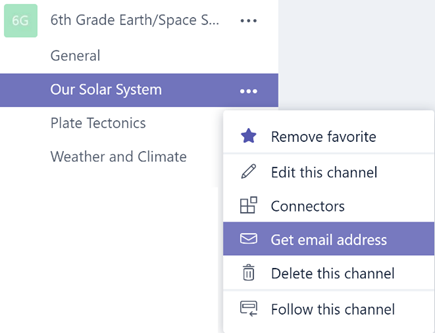 You can send emails to a channel within Teams to keep all your class communications organized and accessible in one place. To create an email address for a channel, select the ellipsis (...) to the right of the channel. Then select Get email address in the dropdown menu. Finally, select the Copy button and save the email address to your contacts list or email address book. Tip: Forward emails into a channel to continue discussions in Teams. 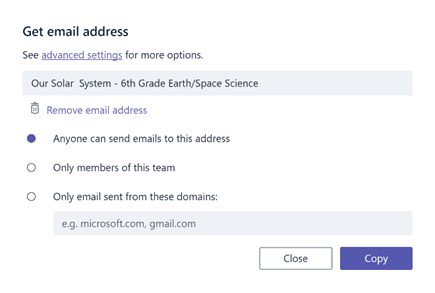 You can click the advanced settings link in the Get email address window to limit who can send emails to the team (for example anyone, only team members, or only emails sent from specified domains). Tip: Limiting who can send emails to a channel will help reduce the likelihood of receiving spam or phishing emails in Teams. You can customize your email notification settings for different events (such as personal @mentions or replies to conversations you start) by clicking on your profile picture in the lower left corner of Teams, then selecting Notifications from the dropdown menu. 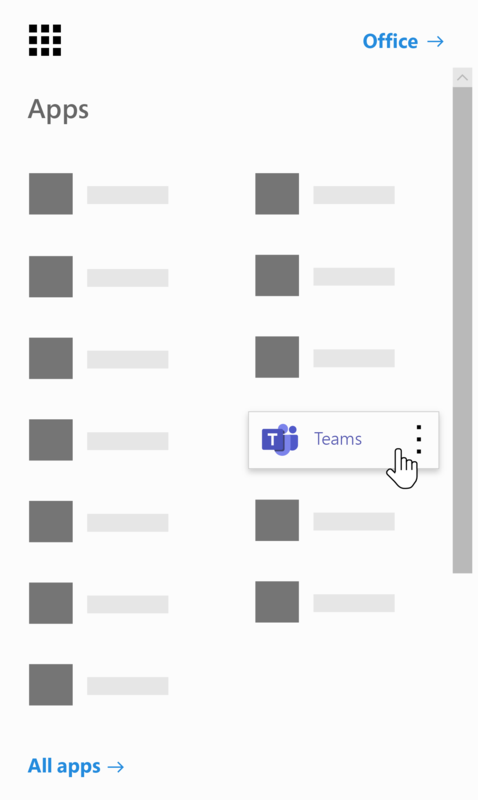 To create assignments in Teams, select the Assignments tab in your class tab. Select the Create button in the top right corner and then select New assignment. In the New assign window, add your assignment details and attach reference materials for your students. You can schedule a due date and time due, and even decide whether your will allow late turn-ins. When you’re done, select the Assign button. Tip: You can save the assignment as a draft if you’re not ready to distribute it yet. Just come back to your Assignments tab later to assign. To review and grade students’ work, head back to the Assignments tab in your class. Select Review to see all the assignments your students have turned in. You can provide feedback and notes down the list or select an individual student’s submission to see their Assignment. You can also navigate to other students quickly and easily right from that view. You may run into a scenarios where you need tor respond to a student (or they need to respond to you) directly but the chat function is disabled. Do not worry as you can always use the @mention function within Teams. Simply use the "@" sign and enter the name of your student then type your comment--that student will be alerted that you responded to them. Keep in mind this is not a private message and will be viewable to all students and educators. 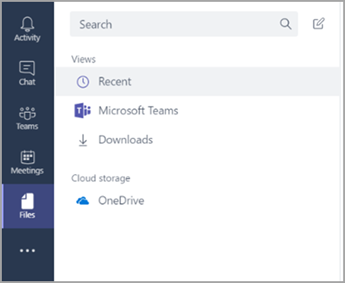 Select the Files button along the left side of the screen, then under Cloud Storage, select OneDrive. Then select Recycle Bin, to browse for deleted notebooks and other content. There currently is no method to archive content. However, I you wish to save notebooks after the semester (quarter) has ended, you could either Add a team and label it "Archived" or you can remove the channels and recover them later in the OneDrive Cloud storage (steps listed above). 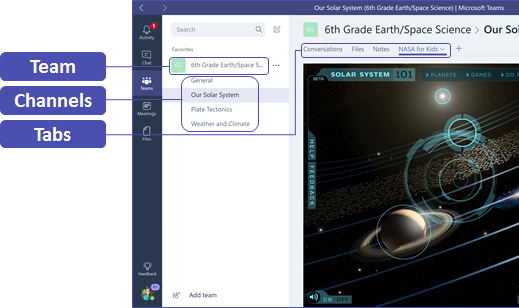 Teams is digital hub for teaching and learning that is fully integrated with Office 365 Education, so team members can easily communicate and collaborate using familiar Office 365 applications like Word, Excel, OneNote Class Notebook, and PowerPoint. For Office 365 for Education subscribers, Teams is free, so you can start right away! You can organize your team by creating custom channels and tabs to meet your collaboration requirements. 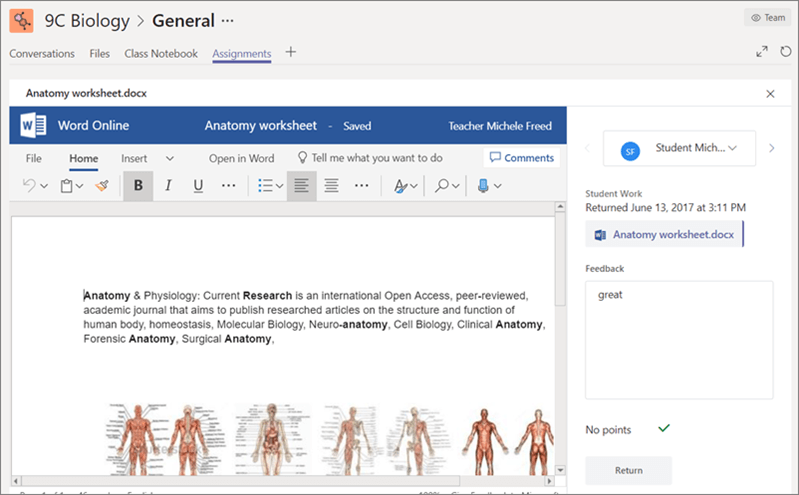 Tabs can link directly to your files and content, to Office 365 applications such as Planner and PowerBI, or to education apps like Flipgrid, Quizlet, and Nearpod! Use your move emails to Teams to keep all of your class conversations in one place. 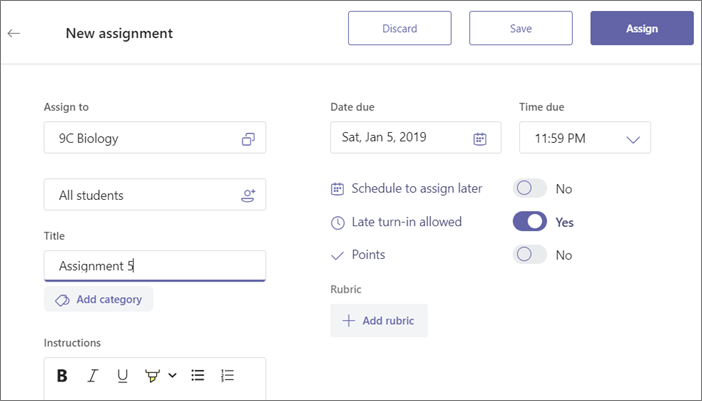 Create Assignments to easily manage your end-to-end class workflow in your class – move from creation and distribution to grading and feedback in no time. You can read more about the new experiences in Teams in Office 365 Educationhere on the Education blog. Explore the Microsoft Education Help Center for other help you might need.